Happy Thanksgiving everyone! At this moment, I am spending Thanksgiving in Paris with my wonderful husband. We haven't been in Paris since our honeymoon six years ago so this is very exciting. There are a few advantages to living in Italy. I scheduled this post for today so I could bring you another installment of Reading Mania Thursday. More bookish gifts to drool over. And since we are approaching Christmas, it seems like a great opportunity to offer some ideas for Christmas related gifts! First, a Christmas ornament or two. There were actually a couple I found that I think would look awesome on our tree. This ornament is so fitting. I think we have all been there, right? This ornament is one I really love. It's an ornament made out of recycled book! I would say you could make this one yourself. But maybe you are like me and it would physically hurt to think of tearing out pages of your own books . . . even for an ornament as cute as this one. This ornament would be a great gift for any librarians in your life. I love that is has the look of a card in a library book. How long has it been since I have seen one of those? You can also personalize this ornament with a name. That's it for today. I will be back next week! Hope everyone has a great holiday. Today is WWW Wednesday, hosted by Should be Reading. This is where we talk about what we are reading, what we have finished reading and what we hope to read soon. What did you recently finish reading? Last week I finished The Death Cure (Maze Runner, Book 3). You can read my review here. What are you currently reading? I am actually reading a couple of things: Goldfinch by Donna Tartt and The Bird Box by KJ Steele. Goldfinch is a very long book (but very good) and I hope to finish it soon. The Bird Box is a recent acquisition from NetGalley. These two books are very heavy, so I felt like I needed something lighter to balance it out. So I am also reading Anna and the French Kiss by Stephanie Perkins. Since this book takes place in Paris and my husband and I are spending Thanksgiving in Paris (yay!! ), I thought this was a great fit. I know, I know . . . three books at one time is a bit much. But there are just so many books I want to read. It's hard to limit myself to one at a time. What will you read next? I have no idea because I have such ADD when it comes to books. I am thinking I will probably read Every Ugly Word by Aimee L. Salter. Hope everyone has a great Thanksgiving weekend! Like I said, my husband and I will be flying out to Paris. Our plane leaves this afternoon and we will be back on Sunday. The last time we were there was for our honeymoon a little over six years ago so I am very excited. I can't think of a better reading spot than in front of the Eiffel Tower. Welcome to Teaser Tuesday! This is a weekly book meme hosted by Miz B of Should be Reading. Today's tease comes from Goldfinch by Donna Tartt. "The memory of that childhood afternoon had sustained me for years; it was as if -- sick with loneliness for my mother -- I'd imprinted on her like some orphaned animal; when in fact, joke on me, she'd been doped up and knocked lamb-daffy from a head injury ready to throw her arms around the first stranger who'd walked in." Does that make you want to read more? So I am participating in a challenge hosted by Roof Beam Reader. Each of these 12 books must have been on your bookshelf or “To Be Read” list for AT LEAST one full year. This means the book cannot have a publication date of 1/1/2014 or later (any book published in the year 2013 or earlier qualifies, as long as it has been on your TBR pile – I WILL be checking publication dates). Caveat: Two (2) alternates are allowed, just in case one or two of the books end up in the “can’t get through” pile. This is an awesome challenge because I have tons of books on my TBR list that have been there for a very, very long time. I will be keeping track of my progress throughout the year and posting reviews for the books I am reading. The best part is that everyone who completes their challenge will be enters to win a $50 gift card from Amazon or The Book Depository! If you are interested in joining the challenge as well, just head over to Roof Beam Reader! I can't wait to actually make a dent in these books. Are there any books you have been meaning to read for a long time, but haven't gotten to? This is my first Musings Monday and it is hosted by Should be Reading. 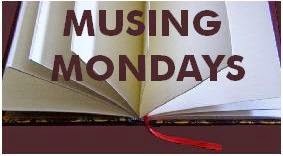 Musings Monday asks you to muse each week about bookish topics, what we are currently reading or one of your reading habits. I thought my first Musings Monday could be about: Ereaders vs. Paper Books. For the longest time, I resisted falling into the digital trap. I flat out refused to get an ereader. There were a lot of reasons for this, mainly that I love the smell of books. I know that sounds weird, but there is something about the smell of a brand new book from the bookstore. I also love the process of going into a bookstore and wondering around, looking at all the pretty covers on the shelves. There were many times I would pick a book based on how it looked in the bookstore alone. But I do read a LOT of books. I can remember going on vacations in the past and packing way too many books. I needed a book for every mood, plus backup books in case I finished those. And I am a very fast reader. I can easily read a book in a day. My husband's family lives in a small town in Alabama. When we go visit them, there is really nothing to do but read. Also, my husband's parents love to read just as much as I do. So it is not uncommon for all of us to sit around the living room and just read. (Best in-laws ever.) In a four day weekend, it is not uncommon for me to be able to read four or five books. My in-laws were actually the ones who bought me my first Kindle (I told you: best in-laws ever). I was hooked immediately and last year, I upgraded to the Kindle Fire. I love that I can carry so many books with me at one time. I know I have over a hundred books on my Kindle. And yet, I keep buying more. I can't stop! I am never without something to read and I have read everywhere: lunch breaks at work, at traffic lights, doctors' waiting rooms. And now that my husband and I are living in Naples, Italy a Kindle is even more important. We do a lot of traveling, by plain and by train. That is a lot of reading time. Another great thing about my Kindle: I can read in bed at night because of the screen light. My husband and I often read before we go to sleep. It is impossible to do that with a paper book without having the light on. Now I haven't given up paper books completely. I still love going into bookstores. I can't pass one without going in. And now that we are in another country, the bookstores are even more beautiful. 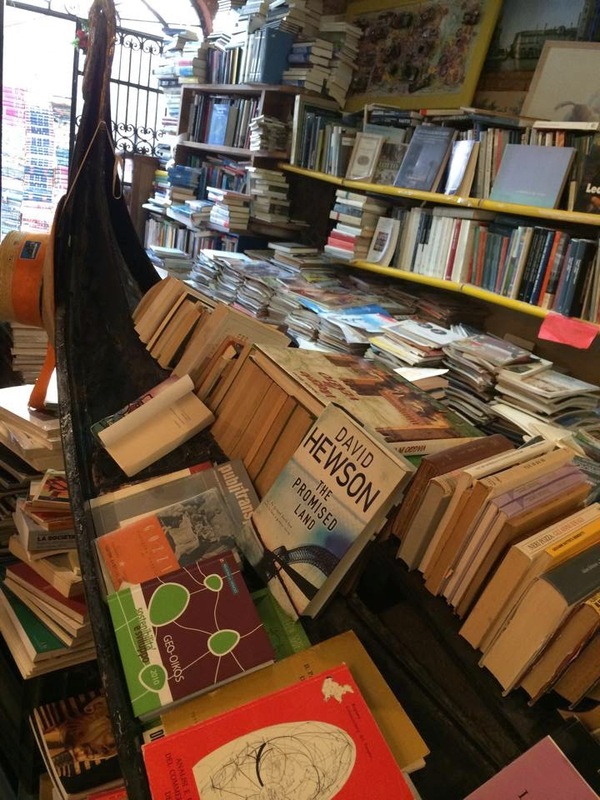 One of the best bookstores I have ever been to was in Venice, Italy (picture on the right). And I recently bought a hardcover 40th edition of Where The Sidewalk Ends by Shel Silverstein (favorite childhood book and really, you can NOT outgrow Shel Silverstein). Which books do you prefer? Ereaders or paper books? Why? This book picks up where the second one left off. Thomas and the other Gladers have been taken by WICKED. Thomas has been separated from the other Gladers and Teresa let him know that they had been told Thomas has the Flare. In the finale of the series, Thomas and the others try to escape from WICKED, while simultaneously trying to figure out what WICKED's end game is. This book had a couple of issues, which I will get to in a second. But the whole book was one action packed adventure. I could not put it down. The book did answer a few of the questions from the other books, like why Thomas was so important and what "Final Candidate" meant. I didn't really like the answer because it sounded a bit insane, but at least I got the answer I was looking for. I will say that I think the first half was better than the second half. The second half of the book was still very action packed, but it seemed very rushed. It looked like the author was just trying to hurry up and get to the ending. One of the issues I had was that Thomas has potentially gotten even more stupid in this final book. There were several decisions he made that literally made me scream at the book, "What are you doing?!?" Good thing I was reading it alone at home. If I had screamed at my Kindle in public, people would have thought I was crazy. One of the decisions he made (spoiler alert) was that he didn't want his memory back. WTF?!? Why would the author make the decision to have almost every character get his or her memory back, except for the main character?? I mean, if Thomas didn't remember what happened prior to the Maze, then why should the reader even care? And there was no point to the character of Teresa. She added nothing to the books. From the first book, I thought she was going to be more important. But then Dashner introduced Brenda in the second book and she became much more important. Of course, a question that the author left unanswered was how much Brenda knew and whether she was good or evil. She made a comment at the end of the book that left the reader questioning that very thing. One other thing that irritated me was the character of Jorge. Why did the author have to make him Hispanic. He said all of two Spanish words (the ENTIRE series), but he would say those same two words in just about every conversation. If the author didn't know any Spanish because hermanos and muchachos, then he shouldn't have bothered. There was also no point to the dreams Thomas kept having or to his memories of his mother. Honestly, I am pretty sure Dashner could have made this series into one long book and cut out most of it. I thought about what kind of rating to give this book. It was fast paced, but there were way more questions than answers. I give the book a rating of 3/5. Happy Friday! This is Friday Finds, hosted by Should Be Reading. Friday Finds showcases the books you "found" and added to your To be Read (TBR) list . . . whether you found them online or in a bookstore or in the library - not necessarily books that you purchased. So my husband has passed along to his coworkers just how much I love reading. This is starting to benefit me because now when they are done with books, they pass them along to me! Now I am a Kindle addict and that is generally where most of my reading comes from. But I still love books in all their forms. Low Pressure by Sandra Brown - Bellamy Lyston was only 12 years old when her sister Susan was killed. 18 years later, Bellamy has written a bestselling novel based on her murder. She published it under a pseudonym to protect her family from the publicity. But when a reporter for a tabloid discovers that the book is based on fact, Bellamy's identity is exposed along with the family scandal. I haven't read Sandra Brown in a while so I am very excited! Amped by Daniel H Wilson - A dystopian novel where scientists have developed implants that treat brain dysfunction - and also make recipients capable of superhuman feats. Politicians have decided to pass a set of laws designed to restrict the rights of these "amplified" humans. I love dystopian novels and this one looks awesome! Some Things That Stay by Sarah Willis - Set in 1950s America, this is a story of a family who is always moving. But fifteen year old Tamara is tired of moving and wants to settle down in the small, rural community of Sherman, New York. Five Days by Douglas Kennedy - Laura leaves her small Maine town to attend a radiography conference in Boston. She is relieved to have a few days break from her difficult job and patients with cancer. A meeting with a guy at the conference leads Laura to question the life that she has always led. The Tiger's Wife by Tea Obreht - In a Balkan country mending from war, Natalia, a young doctor, is compelled to unravel the mysterious circumstances surrounding her beloved grandfather's death. Another find that I recently added to my TBR list can also be blamed on my husband. 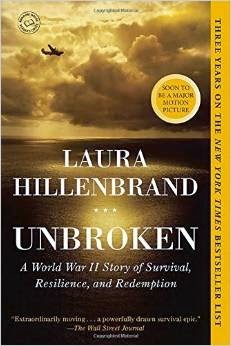 It is Unbroken by Laura Hillenbrand. I had heard of this one, but it was never on my radar. Then he informed me that it was being made into a movie and that he had already read the book two times (high praise from my husband). The movie trailer looks amazing and it automatically made me want to read the book. Check out the movie trailer! I am very excited about this one. Reading Mania Thursdays is where I talk about book related merchandise that I am drooling over. This week's Reading Mania will focus on Great Gatsby related items. I am glad that Christmas is around the corner! I am kind of obsessed with The Great Gatsby. It is one of my favorite books. For any other Great Gatsby fans, this shirt is awesome. Yes, I would love to party with Jay Gatsby! This Great Gatsby necklace from Etsy is so beautiful. I could show everyone my love for the book! And for those who may not be as obsessed with Great Gatsby as I am, this Etsy shop also has Jane Eyre necklace, a Sherlock Holmes one, and even a Breakfast at Tiffany's necklace! This one is my favorite. It is getting colder outside and it is time to bring out the candles! How cute is that candle holder? And this Etsy shop has other bookish candle holders as well. I know it's not Great Gatsby related, but this Princess Bride candle holder is beautiful! And that's not even technically book related since I have never read the book. Blasphemy, I know. The movie was awesome though! 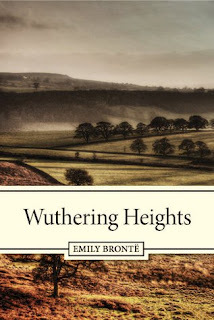 For my first book review, I thought I would review a book that I recently read for the first time: Wuthering Heights by Emily Bronte. I know what you're thinking: how have I gone my whole life without reading this book? It's a classic! There are a lot of classic books that I did not read when I was younger. My earlier reading days were mainly spent on Nancy Drew mysteries or Sweet Valley High. Of course there is nothing wrong with those books. Those books are the ones that started my love of reading! Now I have given myself the goal to read all the classics that I never got a chance to read. I had high hopes for this book. Everyone talks about how romantic Heathcliff was and how great his love was for Catherine. But my hopes were very quickly dashed. If this guy is supposed to be the epitome of the romantic hero, then we are all in trouble. The book starts with a Mr. Lockwood renting a cottage in Thrushcross Grange in the countryside. The owner is the sullen, hostile, mysterious (and this is supposed to be charming) Mr. Heathcliff. Mr. Lockwood falls ill and the housekeeper Ellen Dean (who has known Heathcliff since he was a child) starts narrating the story of Heathcliff, Hindley, and Catherine. She talks about the rivalry between Heathcliff and Hindley and the love that Heathcliff has for Catherine. When Catherine married Linton because he is better suited for her, Heathcliff disappears for a few years. When he comes back, he is determined to get revenge and this quest for revenge even moves into the next generation. It took me a long time to get into this book, mainly because it took a long time for Bronte to get to the main story. I wasn't a fan of the Mr. Lockwood part of the story and I didn't like that the housekeeper was narrating instead of just telling the story. I didn't like any of the characters. Linton was a very dull man who was basically a doormat because he married Catherine even though he knew she loved Heathcliff. Catherine was a spiteful, narcissist who basically throws a tantrum every time she doesn't get her way. And Heathcliff is an abusive brute, who claims to love Catherine but also does everything he can to make her miserable (supposedly in the name of love). What was surprising was that even after the love story between Heathcliff and Catherine was over, the book wasn't even half over. The book continues with the next generation. If possible, Heathcliff is even more cruel to his own son, as well as Catherine's daughter (also named Catherine). The family and marital relationships to become a bit incestuous, but I think that was normal for Victorian times. The main thing I can say about this book is that there were parts of it that were written beautifully. But I just couldn't get past all the awful people. I give the book a rating of 2/5. This is my first blog post and I am so excited! Here is a little about me before we get to the good stuff . . . books! My name is Cynthia. I am married and living in Naples, Italy temporarily. My husband is a civilian employee of the US Navy and we moved to Naples in May of this year. It was quite an adjustment, but I love Italy!! We will be here a total of three to five years. The reason I decided to start this blog is because I am obsessed with books. I have over a hundred books on my Kindle, but I continue to buy more. Hopefully I will get through them at some point. I have been reading for as long as I can remember. My mom used to joke that the world could be ending, but I would not even know because my nose would be stuck in a book. Funny story: my hair once caught on fire from a candle because the power was out and I just had to read! True story. So the point of this blog is to talk about all things book related! I will post reviews, quotes, images, lists and even book related merchandise that I am drooling over. I am sure you are wondering what kind of books I read. I read a lot of young adult fiction, contemporary fiction, dystopian, romance, classics, science fiction, fantasy, thriller, historical fiction and I even sneak in a little nonfiction every once in a while. I have been trying to broaden my horizons and read books out of my usual comfort zone. What is the point of reading if you can't expand your horizons a bit? By: James Dashner, I know I am late on the ball with this one but that is usually how it goes. The first movie just came out and I decided to start the series about two days before it came out. I know the book is always better than the movie, so I (almost always) refuse to see the movie without reading the book first. I finally broke down and started reading this one. It won a Pulitzer Prize for fiction and from other reviews, people either hate it or love it. I am only about 3% of the way through it (just started it yesterday) so it's hard to tell so far. There was a time when I only read one book at a time . . . and I read it very, very quickly. But lately, I have found that I have a bit of book ADD. So I have been reading two or even three books at one time. Yes, it takes me a little longer to read them. But I usually have a variety of stuff to read, depending on my mood. And if you look at those titles, there are very different books. The Goldfinch is very, very heavy. I just started it yesterday, but I can tell that one will take a bit longer. I am so grateful to anyone who has decided to stop by my blog. In case you can't tell, I love reading and I can't wait to share that love of reading with anyone who stops by.